Lately I've been trying to make it a point to read a little bit more and not just constantly re-read the same books (I'm looking at you Harry Potter!). I always end up just re-reading Harry Potter or The Hunger Games or a Sarah Dessen book...and don't get me wrong I love all of those books but sometimes I need to branch out a bit. So far this year I have read two new books and wanted to share them with you. The first was a money related book called Love Your Life Not Theirs by Rachel Cruze. I thought this was a great book! Rachel Cruse is the daughter Dave Ramsey who is a financial expert. Although they are a little more religious then I normally can deal with I really liked her tips on money. The concept of this book is that you shouldn't be trying to keep up with the Joneses because they are probably broke! It was a good reminder that no one can have everything without going into debt and that you need to prioritize what works for your life. Since Tim and I are working on getting out of debt it was a great reminder that we need to focus on our goal and not get sidetracked. I would definitely recommend it if you are trying to get out of debt or get control of your finances! 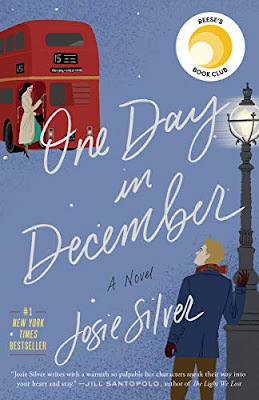 The next book I read was a novel called One Day in December by Josie Silver. This novel came highly recommended and I thought it was so cute! It was an adorable story of a girl who while riding a bus in London falls in love at first sight with a guy at the bus stop. She ends up meeting him later on, but not in the way she expected. If you are looking for a quick read definitely check this one out! It was quick, easy and worth the read. I have a few books that I know I want to read next but since we will be heading off on our honeymoon cruise in less than a month I will need a few books to read during that. Please let me know in the comments what books you have read lately and loved! Call For Help! What To Pack On A Cruise? !